Colloquy between Prof. Yabe and Mr. Takeshi Kitano (aka Beat Takeshi) is published in “Shincho45″ (Dec 2011 Edition). Toyota Motor announced it’s developing a magnesium battery. The company’s technical center in Ann Arbor, Michigan, is working on the magnesium-sulfur battery, complementing development of other future electric-power chemistries at Toyota labs in Japan, Jeffrey Makarewicz, the engineer managing the U.S. project, said in an interview at the North American International Auto Show in Detroit. An explanation movie for “Magnesium-based energy cycling” was published on YouTube. 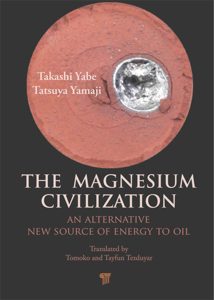 It explains advantages of magnesium as “energy-currency” and experiments of solar-pumped-laser and magnesium-engine. Laser is transmited via an optical fiber on the experiment.